Take this wonderful chance to find the Destiny video games that you are searching for and get them at very low prices. There are countless cheap Destiny deals to choose from, depending on what you are looking for. Our savvy money-saving experts will provide you with useful tips for you to save money. You can check limited cheap Destiny game offers from various sellers and get a discounted rate for your purchases. You can get this entertaining game from popular UK retailers including Tesco, Simply Games, and Amazon. You can even save more money on game bundles. 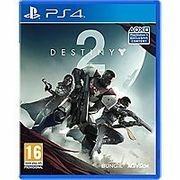 Destiny 2 Forsaken PS4 (Germany) - 12% Off! Find the cheapest Destiny deals and special offers online! Destiny is an online multiplayer video game that was developed by Bungie. This is an exciting first-person shooter game that was published by Activision. It was released worldwide in 2014. You can play it in various kinds of gaming consoles including PlayStation 3, PlayStation 4, Xbox One, and Xbox 360. Destiny is the new gaming console franchise since the Halo game series. It is also the first game in a ten-year agreement by Activision and Bungie. This game is set in a "mythic science fiction" world. It has a "shared-world" environment with various elements of role-playing games. Destiny is divided among player versus player and player versus environment types. It also has a story mission mode that you can play. Players can take on a role of a Guardian or protectors of the last safe city on Earth. The tasks of Guardians are to revive a celestial being named the Traveler. They are also tasked to investigate and destroy alien threats. Destiny has other game expansions that you can try out. These games are very entertaining and will let you play for hours. Play the game with your friends and fight alien scum. 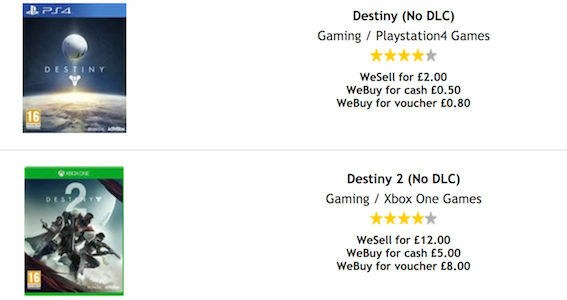 If you’re looking for the cheapest Destiny deals in the UK, you’ll find it here at Latest Deals. Enjoy bargain deals on games including Destiny the Taken King, Destiny Rise of Iron, Destiny 2 PC game, and Destiny PS4 the Collection. We also have the cheapest bundles on Destiny 2 PS4 and Destiny Xbox One. You will surely find your favourite Destiny series here without compromising your budget. Wer have a community of bargain hunters who are always looking for the best Destiny sale, special offers, discounts, and price drops from major UK retailers. We also have a team of money-saving experts who regularly share essential tips and tricks that will be able to help you save on your instore and online shopping. 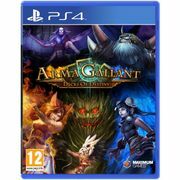 Most online UK retailers have sale events, seasonal clearances, and flash sales where you can get up to 70% off on a wide selection of video games. There are even 3 for 2 offers that can provide you with a lot of savings as well. Watch out for their Black Friday, Cyber Monday, and Boxing Day deals where their prices are reduced even further. If you want to maximise your savings, make sure to use the latest Destiny discount code we have here. We also have Destiny voucher codes where you can get freebies or free shipping. Destiny 2 does a lot to improve, but still runs into a few issues. However that doesn't hold it back from being a fun experience to enjoy with your friends. Red Death. This is one of the honorable mentions on this list. This is a very formidable weapon that you can use in any scenario. You can down an enemy with only a few bursts. This is one of the best weapons in the game because of its increased effectiveness and health recharge. Vex Mythoclast. This is one of the strongest weapons and it has several nerf that you can use to your advantage. You can take down strong enemies with only a few bullets. You can shoot out fusion rifle rounds with this gun. Hunger of Crota. This is a rocket launcher that can cause devastation. It is effective in defeating bosses and enemy groups. It can inflict maximum damage and is one of the best rocket launchers in the game. Thunderlord. This can cause high damage. It is very fun to use with its 60-round clip. It also has great accuracy and can kill enemies even at a distance. It has furious lighting rounds that can lock onto the weak spots of bosses. Vision of Confluence. This is a legendary weapon that you should keep in your primary weapon slot. It is a full auto scout rifle that can cause serious damage. It is the most accurate automatic rifle in the game. Fatebringer. This weapon is deadly accurate. The only downside to it is that it maxes out at 300 attacks. It is very hard to acquire but it is well worth it if you have it in your arsenal. You can finish enemies with the cannons arc damage. Gjallarhorn. It has a very cool design and it is a very powerful weapon. This rocket launcher can cause destruction and can shoot out eight Wolfpack Rounds. Ice Breaker. This is an essential tool that you should have in your arsenal. It is one of the most coveted weapons in Destiny. This is the Swiss army knife of all weapons. You can finish off enemies without leaving your cover because of its No Backpack perk.